When I was harvesting some potatoes the other day, I came across this small pile of eggs. Thanks to Susan's post of a few weeks ago, I immediately recognised them as lizard eggs. I carefully moved them to a sandy spot, where I hoped that they would continue to develop and hatch, without fear of me disturbing them with a spade or fork. You can see the size of them compared with my fingers; some were smaller than others. Noushka tells me that these two photos are of newts. I was a little surprised as we have no water near us! I managed to get this very distant picture of a hoopoe in the garden the other day and which I have tried to blow up so it is visible. You can see how the bits of rain we have had have greened up the lawn, though it is still quite brown in places! 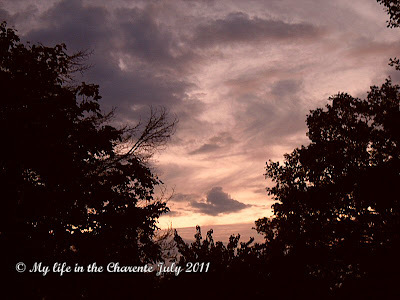 and just to end off, I loved this evening sky of windswept clouds, which I took last night. Let us know if you managed to save those little lizards!!!! I have never seen lizard eggs in the garden. Very cool. I need to pay more attention when I am digging in my yard. I have a lot of lizards. We are not very good with creepy crawlies, but these are wonderful images which you have captured here. Never before have we seen lizard eggs. They are fascinating. I can handle little lizards like those Diane but any bigger and I'm not so keen! Never knew about the eggs, interesting. diane, you even dare to put them in your palms?! i could have yelled them off, haha! What a cool job, Diane! We do have too many lizard eggs around here. Almost everywhere! Errrrr..... Anyway, hope you're having a great day. I have been looking forward to this post since you told me about your find Diane. So interesting to see the lizards and a bonus photo of the hoopoe I have not managed to get one of them yet this year. Je n'ai jamais vu d'oeufs de lézards. Merci de nous les montrer. Votre jardin est un vrai paradis pour toutes les petites bêtes! Et la huppe ne se trompe pas: elle sait qu'elle peut trouver un bon repas dans le sol. You've got some great pictures there Diane. 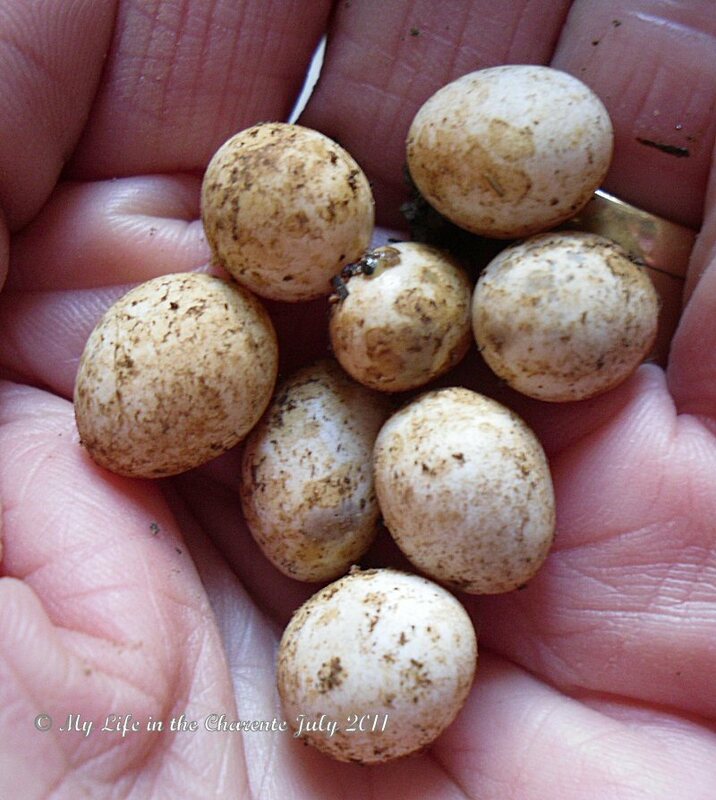 Love the photo of the lizard eggs. I hope they can continue on to hatch! Those lizard eggs are so tiny it would seem hard to find them. It's nice that the little guys have a home in your garden. What a gorgeous post, love those little eggs, what a surprise to find! I didn't realize that lizards laid eggs. But, eww, I hate lizards. You are brave. I have just learned to accept geckos. Good photos. I have to admit that I'm quite scared of lizards though. They remind me of snakes which I'm terrified of. Diane, you are very brave ! I don't think I dare to touch this. Those little lizards are so interesting. Very territorial I think, hardly ever wandering far from home. I've never seen their eggs. How fabulous to discover them! We have a lot of lizzards here but I have never seen their eggs. Love the picture of the beautiful sky! Lizards are wonderful... they eat bugs!! What could be better in a garden. Yours are quite lovely... aren't you sweet to protect their eggs from harm. Hope they thrive to take care of those evil garden bugs! I was so surprised to see the little lizard and eggs..What a cute find. When we grew potatoes, our oldest daughter came screaming..she dug a mouse family up..Have to admit, we still laugh about it. Never saw a hoopoe before..Looks very interesting. My kids would love to have lizards running around our yard. Hope the eggs hatch. These are the cutest lizards I've seen in a long time. The photos are so sweet. You just made my day. Those are great pictures of the lizard and lizard eggs. I would have thought we would have seen some lizards around our house in Provence but so far no lizards but we have seen scorpions. The first time I saw lizard eggs was on Susan's blog too. Even Lucie has never seen any, which is really amazing. I like the sound hoopoes make. You know that when you don't hear them anymore, cold weather is on its way. Just found your blog. Very interesting post with great pics. Especially like the last one of the night sky. Saw that you once lived in Rhodesia, I lived there when was around 8 - some 40 years ago. We only stayed there about 18 months but left an abiding memory for me. Just found your pages on Rhodesia - very interesting reading. I used to live there when I was around 8 years old in the the early 1970's. I loved it there and would love to go back but like you say not really feasable. Have become a new follower. 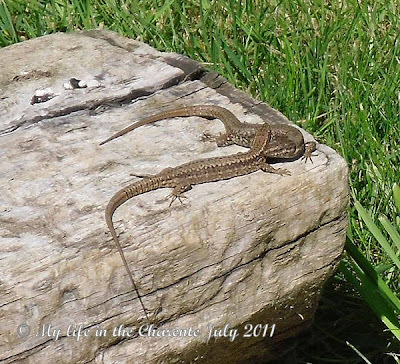 I love the lizards which live here, although there are not so many now the house and barns are being sorted out. But I love to see the scuttling about, and well done you for doing your best with those eggs. Hope you are well, and hope you have a lovely weekend. Hi Ellie, thanks for the visit and following my blog. I still have many friend left in (Rhodesia) Zimbabwe, and although life has improved a bit since it changed to the $ it is still not easy for them. I don't think I would now like to go back, I have such good memories that I do not want to spoil them! 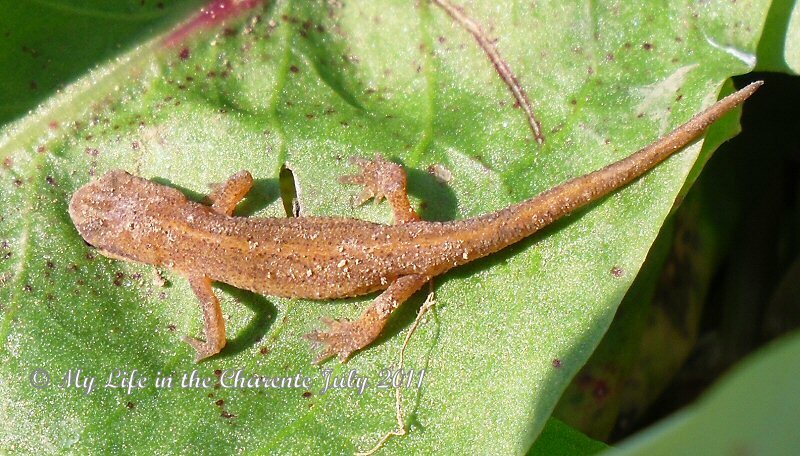 Pics N2 & N3 are a young Newt! 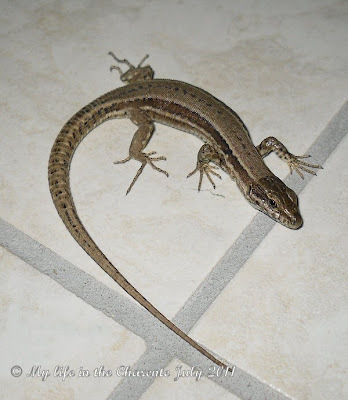 Lizards are great prey for the Smooth snake... you will see on the 1rst of August on my blog! A great little snake to have around, totally harmless and useful around a garden!! I can see your is full of life! I came to look at your last few posts – all very interesting. The mackerel recipe sounds delicious. The bugs are pretty – from afar. I would have liked to witness the Nuits Romanes. Do you know what they are? They are not nuits romantiques, but “romanes.” They take from the “Art Roman” which is the period between 1030 and the XII century and which happened in France, Italy, Germany, Spain and Portugal at the same time (http://fr.wikipedia.org/wiki/Art_roman.) The Akubra hat is very handsome – but we don’t need it here as we get some good soaking with our thunderstorms. 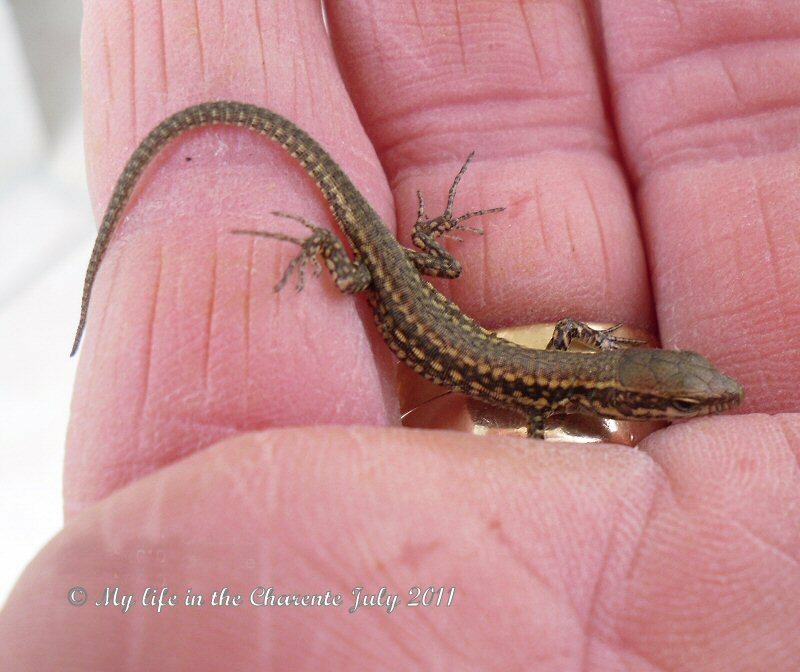 I like your little lizards – we have many different kinds in our yard too. It's always a pleasure to visit your blog. Great post. The little lizards are so cute and help keep bugs down. Sure hope the eggs make it. Love the sky! Wow, nice find Diane. I used to find those eggs when I was still in the Philippines as we have so many of those there. But when I came here, I have never seen one. Love the sunset shot. 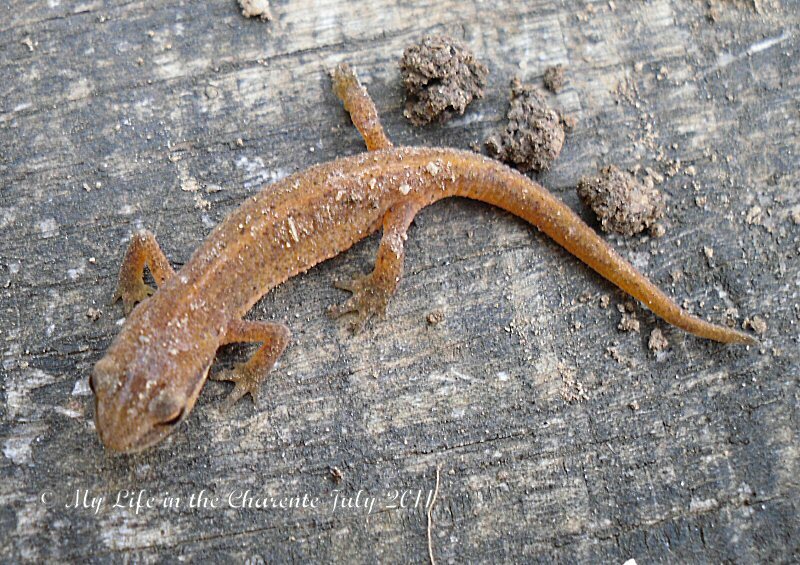 Well the lizard population in France will thank you for saving them. Love your recipe for the wings! It was so nice seeing the "pebbles" finished. I'm sure you are getting some ideas for their use in your terrace. Hope the rain continues a bit for your garden. I would have to put the hat away today as we have had rain, rain rain. Cheers! Wow, what a great website. I would love to retire in France! I saw your website on Cate Can Cook and I am so pleased I came over for a look! What a gorgeous little lizard, and eggs too!! You have done so much travel I am in awe! Lizard eggs? WOW! What a find. Lovely little creatures.